A great organization and a chance to check out the new venue if you haven't already. Austin Music People (AMP) Executive Director Paul Oveisi announced today that the 501 c (6) non-profit organization will host their launch party and benefit on Thursday, March 31st at ACL Live at The Moody Theater. AMP is dedicated to preserving the Austin music culture by working with Austin music businesses, musicians and fans. To mark the launch, AMP has brought together a diverse lineup of all-star Austin musicians to represent the equally diverse lineup of fans in our community. The benefit/launch party will take place in Austin’s newest multi media live music venue (and the new home of Austin City Limits), ACL Live at The Moody Theater. 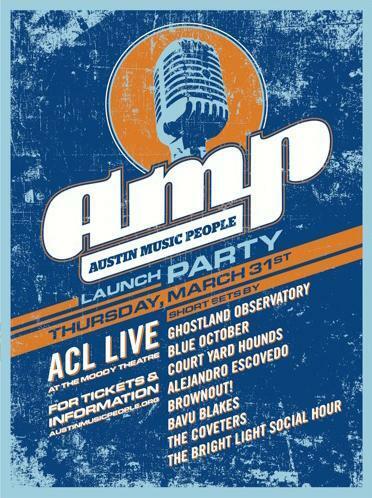 The AMP benefit will feature short sets by such renowned Austin acts as Ghostland Observatory, Blue October, Court Yard Hounds, Alejandro Escovedo, Brownout!, Bavu Blakes, The Coveters and Bright Light Social Hour. “This bill is Austin Music People, and I am honored to be included as a performer and a member,” says Adrian Quesada of Brownout!. $20 Community Membership – ticket to the floor and balcony and membership that includes invites to exclusive AMP events, special discounts and giveaways. $250 Professional Membership – ticket to mezzanine seating as well as a pre-show VIP Happy Hour reception with AMP’s Board and professional members. Plus, AMP membership includes regular professional networking gatherings, project opportunities, key updates, invites to AMP events, and special discounts and giveaways. Tickets can be purchased at www.acl-live.com and www.austinmusicpeople.org. Doors are 6:00pm.